Whole cluster fermented.The Moor continues to weave his spell, guiding us through alternate histories and elliptical futures. Alvarelhão? There is no other. All Forlorn Hope wines are produced from winegrapes. That’s it. We believe very strongly that site and farming produce all that we should like to find in a bottle of wine, and we don’t want to confuse or muddy the story that each wine can relate by adding water or yeast or acid or enzymes that had nothing at all to do with what the vines put into each of our clusters. 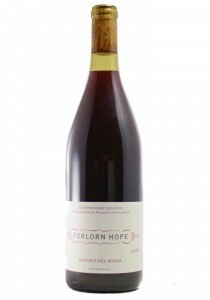 Each of the Forlorn Hope wines may be put through very different fermentations en route to becoming one of our Rare Creatures — Sèmillon is destemmed and pressed, then fermented in old and neutral barrels; Gewürztraminer is destemmed and fermented on the skins; Alvarelhão is fermented whole-cluster with no destemming or initial breaking of the fruit — but throughout it all a common vein runs through the thought process in the cellar: listen to what the fermentation is saying as it transforms from fruit into wine. What does it want to become? In what direction does its nature want to lead it? In this manner we guide our ferments along, receiving suggestions and guidance from the wine and fermentative microbes themselves. No new barrels are ever used in the Forlorn Hope cellar. Currently, our oldest 60 gallon vessels are from the 1997 vintage.